Takeaway: The risks associated with an occupation should factor into an applicant's job search. When choosing a career path, few people consider their odds of being injured in the workplace. 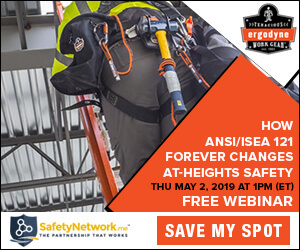 While some industries, like construction or manufacturing, are known to be more accident-prone than desk-heavy jobs, every environment bears risks to some extent (learn about the Top 6 Construction Hazards). Knowing where these hazards lie and how high the risk of injury actually is might just affect one’s decision of where to apply for a job. After all, a serious injury can be life-changing, so it's important to consider your safety during your job search. What Are the Riskiest Jobs? 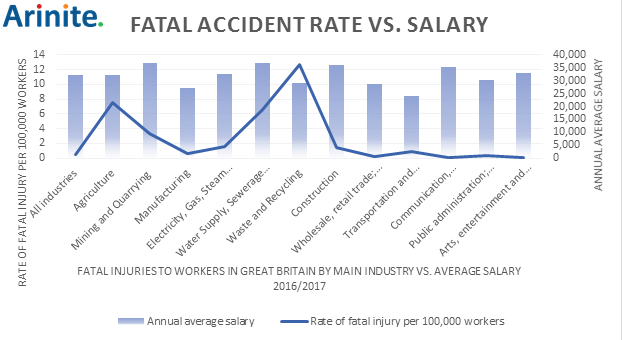 Recent data published by Health and Safety consultants Arinite compared industry salaries with the risk of being in a fatal accident at work. 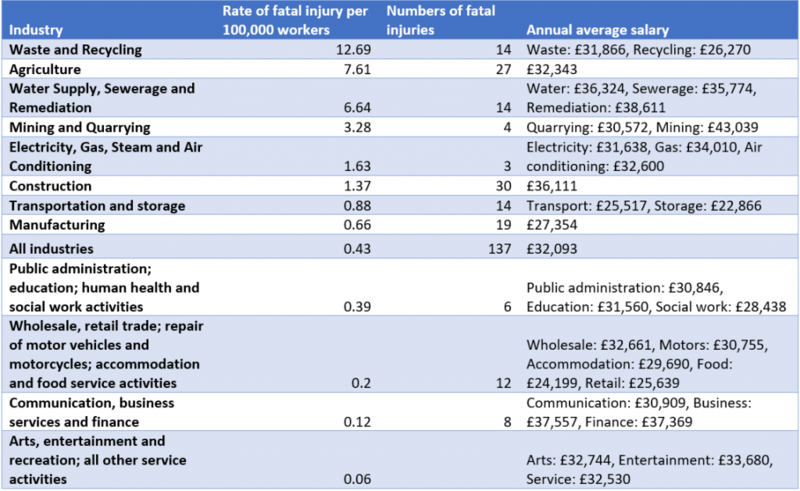 The Health and Safety Executive’s stats on fatal injuries in the UK in 2016/2017 were put next to the average annual salary in twelve different industries to identify whether they correlate. As is to be expected, manual jobs showed the highest risk of fatal injury. Waste and Recycling came out recording the most fatal injuries in 2016/2017, with a rate of 12.69 in every 100,000 workers dying from an accident in workplace. And yet, workers in Waste get paid slightly below the national average of £32,093 with £31,866 annually, while Recycling offers one of the lowest incomes across all industries, with £26,270 on average. Next in ranking were Agriculture (7.61), Water Supply, Sewerage and Remediation (6.64) and Mining and Quarrying (3.28), which recorded fatal accident rates still significantly higher than the average of 0.43 across all industries. All of them boast salaries higher than national average, with Remediation (£38,611) and Mining (£43,039) paying highest across all industries. Industries with the lowest fatal accident rates include Arts, Entertainment, Service (0.06) or Communication (0.12), which all pay about the same as the national average salary. On the other hand, industries like Food (£24,199) or Retail (£25,639) get paid comparably low, while recording a higher accident rate of 0.2. One must consider though that the annual salary shown in the table above is calculated by adding every job within an industry together, meaning high salaries (such as that of a managing surveyor) and relatively low incomes (such as that of construction workers) get merged into an average. Looking at these numbers, it becomes obvious that the risk of being in a fatal accident and the average salary do not correlate. The probability of a serious accident is not always compensated by a higher income, as some highly dangerous jobs pay relatively low and vice versa. Taking high risks at work literally doesn’t pay off. While companies might not be able to increase payment accordingly, mitigating health and safety risks in workplace is fairly easy and inexpensive. Setting up precautions and assuring that workers are appropriately trained and communicating well, can prevent accidents in the first place and therefore create a more productive and appealing working environment (see Safe By Accident to learn more about ensuring worker safety).